The task was the construction of three plants for the extraction of a large number of very varied high-quality natural raw materials such as leaves, roots, herbs, spices, barks and seeds. This was to be followed by distillation or rectification to produce natural extracts, aromas, and extracted base materials for the food and beverage industry. An additional challenge were the spatial restrictions from the existing building structure, the optimum integration of the plants into the existing site infrastructure, and the precise weighing technology. Three small-scale extractors or percolators with a volume of 0.25 – 0.5 m³ were designed as a "single vessel" plant for most fibrous plant components. 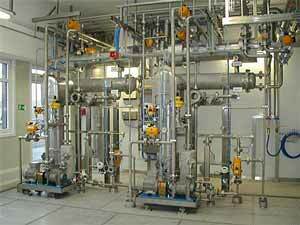 They were also used for the gentle distillation or rectification under vacuum and have been equipped with an automatic weighing system. The vapour condensation above the distillation column is carried out in two stages using cooling water and cooling brine. 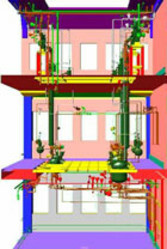 After a construction time of only five months, three plants over three floors were ready for commissioning, including steel construction, connection to steam, cooling water, cooling brine, weighing cells and programmed control system.